As the leader in your guild, you will have access to the Administrative Panel, where you can control all sorts of things to do with your guild. The panel is situated under your Guild Stats in the guild navbar and appears on every page in your guild. Only you (and others you've given admin privileges to) will be able to see it, its hidden from the normal members. This controls the things people can see about your guild - homepage layout, guild description, guild ranks, etc - and has four major subsections. Things like your guild's name, description, colour scheme and layout are edited via the Modify Guild Preferences link. These are the things a potential member can see even before they join - and you want to make a good impression! You can also chose if your guild is private or not here. Private guilds don't appear in any search results and require potential members to receive an invite before they can join. Modify Guild Hierarchy affects the names of the ranks available in your guild. More information about the importance of ranks can be found here. To modify your guild's keywords click on Modify Guild Keywords. Keywords are important, especially for public guilds as they affect whether or not your guild will appear when potential members use the guild search feature. 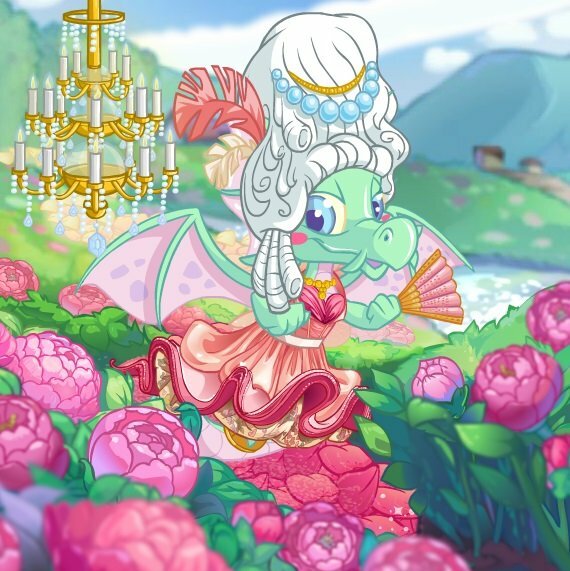 Try to use sensible, relevant keywords that accurately describe your guild - is it Neopets related? Celebrity? Music? - so that members with similar interests find you! The final option, Upload/Change Guild Logo, is where you can edit your guild's logo. Your logo appears in the top left-hand corner of every guild page and - in an ideal world - matches the overall colour-scheme you chose in the preferences. Logos must be saved in either .JPG or .GIF format before you upload them, and be smaller than 100px by 100px. Generally, these are the things that most people will spend the most time on when they start a new guild. What you choose here will affect the types of members your guild attracts. Remember, there are hundreds of thousands of guilds in Neopia - you need to have something that sets yours apart in order to attract members! "Come on - I'm exactly who you were looking for, aren't I?" This is where (obviously) you can edit things about your members. At first glance, it just appears like the normal list of members that everyone can see - except with a search feature. This list has some very useful differences - you can choose to order your members by their username, rank (default), post count, or the date they were last active. You change the order by clicking on the heading you want to sort by. The only columns you cannot sort by are Status and the date your members joined. The other major difference to the normal members list is that when you click on a member's username here you're taken to a page where you can edit various things about that member, instead of simply to their Neopets lookup. On this page you can change a member's rank, suspend the member (this bans them, temporarily, from accessing your guild's pages - you need to remove their suspension for them to get access again), delete the member, or permanently ban them. A permanent ban means that they will be deleted, and won't ever be able to join again. This is also where you assign Admin privileges - you can choose to give a member as many or as few privileges as you want. These can later be removed from this page as well. Members with Admin privileges appear in the member list with a little blue star beside their names. When your guild has open (empty) Council positions a link appears next to the empty council spot where your members can click to Apply for that position. After someone applies, their application is recorded in the Council admin for you to look at and decide whether to accept or reject. If you decide to accept an applicant then their rank is automatically changed to that of the Council position they applied for; if you reject them then the application just vanishes. Either way however, no notification is sent to the member who applied so you may like to drop them a friendly neomail to let them know of your decision. 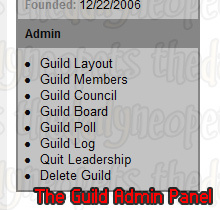 This is the main admin section for the guild's message board. 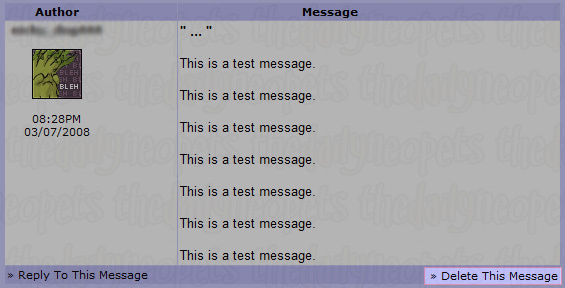 From here, you can delete older messages, or messages from a specific member (this is good if you've had a spammer on your board). You, and other members who have been given Board admin privileges, will also see an option to delete individual posts on the main guild board. "Now see, you didn't want this nasty test here, did you?" 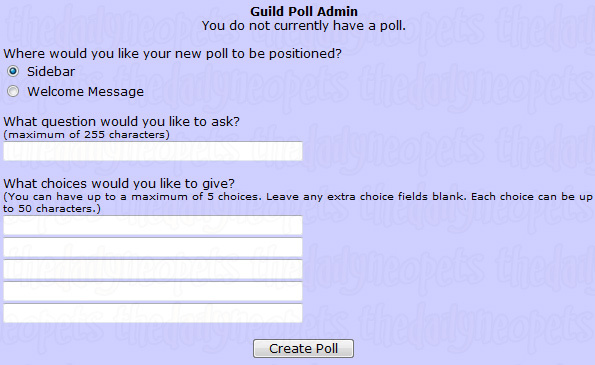 Predictably, Poll admin is all related to setting up and maintaining your guild's current poll. Polls are a great way for you to get to know your member's preferences, to start a debate on the guild board, or to let your members have input on management decisions. You can have up to five choices for each poll and when you first create the poll (and later, if you want to change it), you'll have the option of where you want your poll to be displayed - in the guild navbar (and thus on every guild page) or just on the homepage. After you set up your poll, you will be given the option to activate it - you need to do this before any members can see it. You can only have one poll at a time - if you want to make a new one you must first delete the old one. 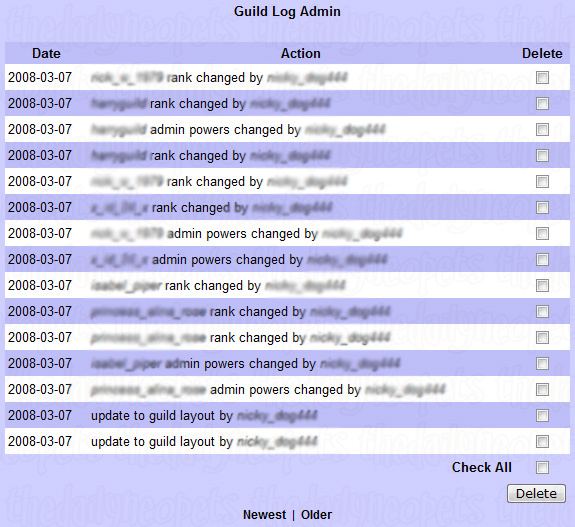 This is just a record of all Admin actions that have been performed in your guild. It shows who has done what and when. It serves very little purpose, but might be useful to see who messed something up if anything goes wrong. This option is only for the you as the guild's Leader. You can quit running the guild, and you'll become a Normal Member. 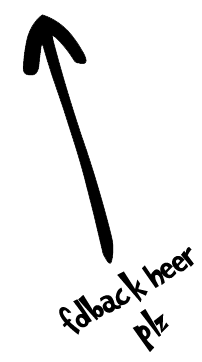 Power will go to the person below you in the Council. If you wish to remain in Council, or with Admin, you need to sort this out with your replacement beforehand, as you will return to being a normal member! Again, this option is only for you as the guild's Leader. It deletes the whole guild, but you must've deleted every member through the 'Guild Members' panel first, so that you're the only one left when it's deleted.